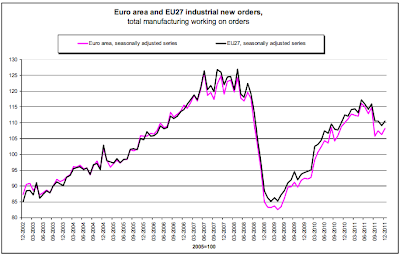 In December 2011 compared with November 2011, the euro area (EA17) industrial new orders index rose by 1.9%, after a fall of 1.1% in November. 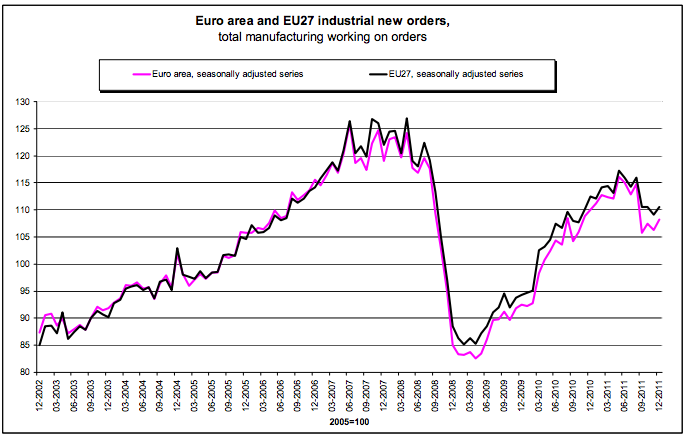 In the EU27 new orders increased by 1.3% in December 2011, after a decrease of 1.2% in November. Excluding ships, railway & aerospace equipment, for which changes tend to be more volatile, industrial new orders gained 2.5% in the euro area and 2.6% in the EU27. While that certainly doesn't make up for the precipitous fall in September, at least it's not still going down.